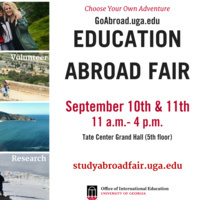 Explore all study, volunteer, intern and travel abroad options at the Study Abroad Fair. More than 100 different programs will be represented. Find out about scholarships and financial aid to help fund experience.